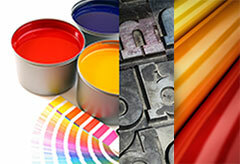 The Print shop provides high quality print and copy products in a timely manner. The print shop staff attempt diligently to finish jobs within 24 hours. This busy shop provides Digital Print, Printing, Bindery and Folding services. The print shop equipment consists of a Ryobi four-color press; two, two-color presses, one 90 page per minute Ricoh color copier, two 105ppm black and white copiers, and two 95ppm black and white copiers and it has recently acquired an 80 page booklet maker, UV coater and a creaser. This area generates a comprehensive list of products which is outlined below. One color, two color, and four color offset printing. Completed work may be picked up or sent via interoffice mail, if requested, on the due date listed on the Work Request Form. Small packages of completed work for delivery to all buildings will be delivered by mailroom personnel. Email centralreceiving@jjay.cuny.edu or mmerseburg@jjay.cuny.edu to request pick-up and delivery of all jobs, three (3) boxes or more. Let the print shop know if you will make a pick-up personally.